A multinational team of scholars focuses on the interface between Christian doctrine and scientific research on human origins, exploring the theological consequences of scientific thought for the doctrines of original sin, the image of God, and the problem of evil. Moving past the misperception that science and faith are irreconcilable, the book compares alternative models to those that have generated faith-science conflict and equips students, pastors, and anyone interested in origins to develop a critical and scientifically informed orthodox faith. 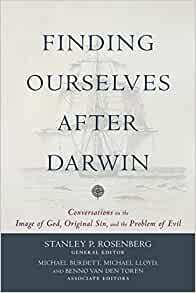 Start reading Finding Ourselves after Darwin on your Kindle in under a minute. "An important conversation on post-Darwinian challenges to Christian theology. Sometimes the authors disagree, but more often they provide complementary perspectives to questions concerning original sin, evil, theodicy, and the image of God. This book will challenge the reader to think about--and perhaps to rethink--these key aspects of the Christian faith." "This is not just another book on theology and evolution but a serious attempt by well-established and emerging scholars to grapple with the most pressing theological issues that result from that engagement. It will be extremely useful for teaching and deserves to be fully embedded in theology courses as well as those in theology and science." "Too often reading books on science and religion by multiple authors feels like walking into a cramped room where everyone is shouting. This book feels more like entering a big open hall where there is room to breathe and room to think." This collection of essays is one result of a research project at Oxford University which “assembled scholarship presenting different approaches and methods and insights, introducing a variety of models that may be considered . . .” (p. 8). The individual authors are primarily theologians and biblical scholars, some with a science background. As the title implies, biological evolution is presupposed, and the issue is how to think about the image of God, original sin, and the problem of evil in the light of biological evolution. The book is divided into three parts, one for each topic. Each part includes a brief introduction, a discussion of the questions, challenges, and concerns for the topic, several essays offering different approaches, and a conclusion and further reading list. Part 3 deals with the problem of evil by presenting a variety of approaches. Essayists discuss Augustinian, Irenaeasn, fall-of-the-angels, free process, only way, and non-identity theodicy and how they relate to evolution. The concluding essay by Michael Lloyd suggests that, despite their differences, the contributors to this part seem to believe the following: (1) the current state of evolutionary biology and modern genetics leaves plenty of room in which to do theodicy, (2) the seriousness of the problem of evil in relation to the evolutionary processes, (3) this volume falls far short of a full theodical narrative, and (4) their positions still have challenges to face and work to do. The three Further Reading lists, the 26-page Bibliography, and the numerous informative footnotes provide a wealth of opportunities to pursue specific topics of personal interest.